Alliance Holdings GP, LP (AHGP) recently hit a new all-time high of $40.44 after reporting a solid 28% Q2 earnings surprise in late July as the industry recovers from a tough 2009. With estimates on the rise and a hefty dividend yield of more than 5%, AHGP has some solid upward momentum. Alliance Holdings GP, LP, through its subsidiaries, produces and markets coal to utilities and industrial users in the United States and has a market cap of $2.27 billion. With the coal industry on the up swing on the back of a stronger global economy, Alliance was able to deliver better than expected Q2 results on July 28 that contained a 28% earnings surprise. Revenue for the period was up 32% from last year to $400 million. Earnings also came in strong at 77 cents, 28% ahead of the Zacks Consensus Estimate, lifting the company’s average earnings surprise to 15% over the last four quarters. The company also announced a quarterly distribution to unit holders of 48.25 cents, a 13% increase from last year for an annualized rate of $1.93. The solid results were driven by its limited partner’s (ARLP) exposure to the Illinois Basin, where production costs have typically been less expensive than the Central Appalachia region. Alliance has also created a lot of visibility into its longer-term earnings, locking in most of its price and volume for next year. The company did see some movement on the balance sheet, with its cash and equivalents down $146 million to $13 million and its total debt down $13 million to $446 million. It’s long-term debt to capital ratio is 52%, easily beating the industry average of 95%. Estimates took a nice jump on the good quarter, with the current year adding 50 cents to $2.92. The next-year estimate is up 65 cents in the same time to $3.12, a 7% growth projection. The valuation pictures looks solid too, with a forward P/E of 13X slightly besting the industry average of 13.86X. AHGP recently hit a new all-time high at $40.44 after jumping higher on the good quarter. 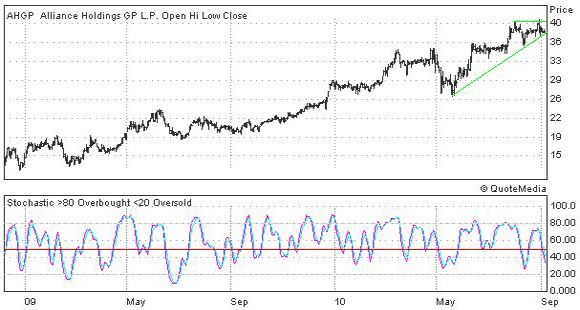 The stochastic below the chart is signaling that shares are trading well away from over-bought territory, take a look below.